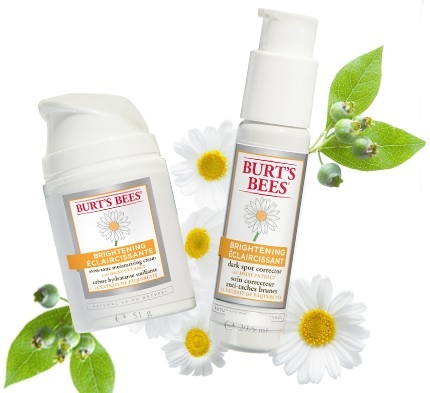 Brighten up naturally with Burt's Bees Brightening Collection! Brightening becomes a more natural thing with Burt's Bees new brightening regimen - with dermatologist-tested and clinically-proven products that visibly brighten skin and even skin tone while improving skin hydration and the appearance of fine lines and wrinkles. Both derive their potency from wild, white daisies sustainably harvested int he mountains of Macedonia. Daisy extract has been shown to be a natural skin brightening agent, helping to reduce the appearance of dark spots and pigmentation. When combined with a multi-fruit complex including extracts of bilberry, sugar cane, sugar maple, orange and lemon, it makes for a powerful formula with amazing brightening effects! Available now at grocery, drug and mass retailers across Canada as well as online at www.bursbees.ca.